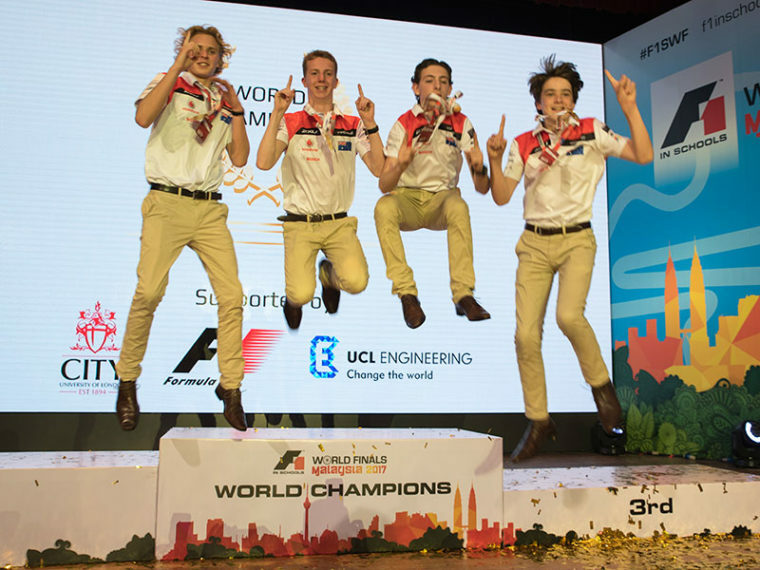 Four high school students from Melbourne’s Trinity Grammar School recently took home the prestigious title of World Champions at the 2017 F1 in Schools World Championship in Malaysia – and that’s only the beginning. Otherwise known as Team Hyperdrive, these 15-17 year olds are a force to be reckoned with, taking home the race with their car, which also won one of the most coveted awards in the competition – Best Engineered Car. We had a chat with Team Hyperdrive, who told us more about the competition, IoT technology, and what’s next for them. For the uninitiated, F1 in Schools is the world’s largest STEM competition, involving nine million students from 17,000 schools from all over the world. 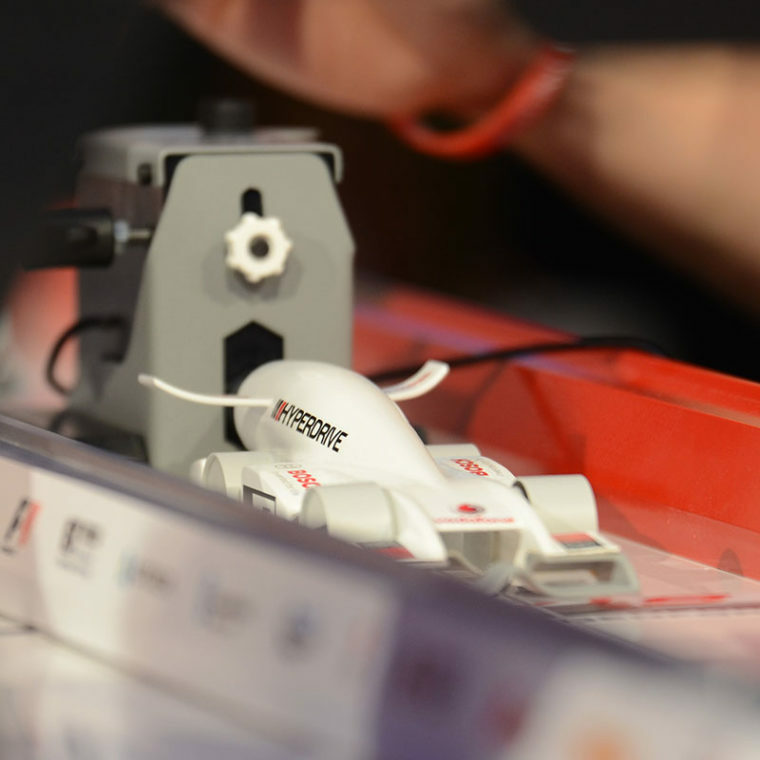 Teams are challenged to design, test and make miniature F1 cars capable of travelling at 80km/hr. Vodafone was one of the team’s proud sponsors, partially funding their journey to the World Finals. Hugh Bowman, Kyle Winkler, David Grieg and Alec Alder of Team Hyperdrive started their route into the world of race car design at school. They credit a lot of their success to their teacher, Mr Peter Clinton, who encouraged them to get involved with F1 in Schools, and provided invaluable guidance along the way. Team Hyperdrive’s road to the World Finals was a long one, blitzing the Regionals, Nationals, and finally taking the crown at the World Finals. At the competition, they were judged on their compliance with F1 in Schools Technical Regulations, engineering of the car, their portfolio and pit display, a verbal presentation, and finally a race on the official 25-metre F1 in Schools competition track. Team Hyperdrive’s race car, powered by Vodafone. RW: What technology are you most excited about at the moment? Team Hyperdrive: The team are excited about the greater interconnectivity of the world through IoT and using data to improve daily lives. We’ve been able to see first-hand how Formula 1, the pinnacle of engineering technology, is using IoT infrastructure and technology and are keen to see how it becomes relevant to everyday life as well as the commercial environment. This use of IoT technology integrated into F1 cars and teams’ operations showcases perfectly how technology, data, sensors and people can function together collaboratively to make for smoother, more successful performance. RW: What was the biggest design challenge Team Hyperdrive faced when creating your car? 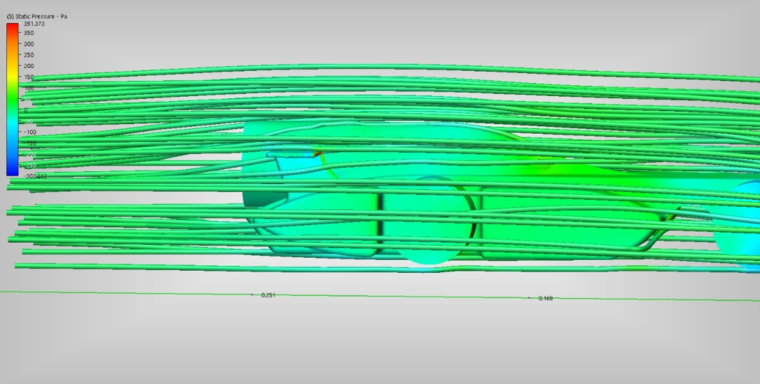 Team Hyperdrive: The greatest challenge involved in designing the car was aerodynamics. No one fully understands aerodynamics, and there is a compromise between aerodynamic performance and the mechanical forces of the car. 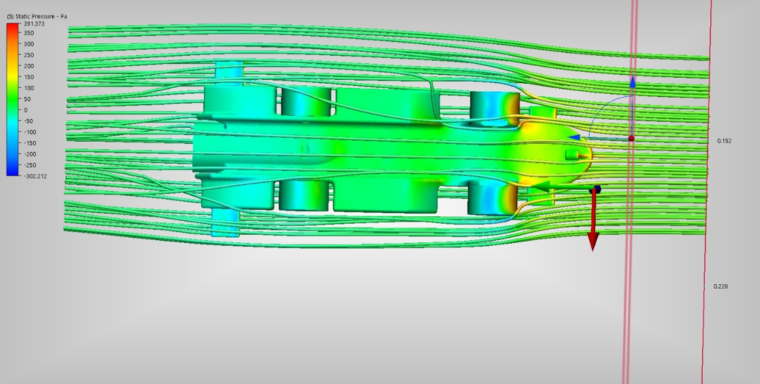 David was our aerodynamics engineer, running many Computational Fluid Dynamics (CFD) simulations as well as research and testing on different shapes and design concepts around multiple sections of the car. Continuous aerodynamic refinement and evolution was key to our development strategy in order to minimise drag and create efficiency. Once the aerodynamic shape was formulated and the ‘chassis’ design was complete, the mechanical components of the car could be implemented around it. Computational Fluid Dynamics (CFD) simulation diagrams. RW: Does the team have any pre-competition rituals? If you can count several late nights and last-minute printing as a pre-competition ritual… then sure, yes! In all seriousness however, the team always goes out for a nice dinner before any competition to discuss our plan going into the few days, as well as build the team spirit and cohesion that is so important in the intense environment we find ourselves in. A team dinner allows us to know as a group that we’re in it together and that we need to focus on our project and do the best we can do; everyone/everything else is out of our control. RW: Now that you’re the F1 in Schools World Champions, could you see yourself pursuing F1 as a career? Team Hyperdrive: The team could all see ourselves working in a motorsport environment, however the program provides such transferable skills that any career path, whether relating to advanced engineering or even business and marketing, is possible to pursue. Formula 1 in particular, though, is where we all want to be. We have been given exclusive insight into the world of F1 through F1 in Schools and really want to capitalise on that, having built a strong network already in the Formula 1 ‘paddock’. World Champions Hugh, Kyle, David and Alec – winning is a pretty great feeling! With the competition done and dusted, it’s back to reality for Team Hyperdrive. The first priority for them is finishing school and achieving the best results possible, as Kyle and Hugh are completing year 12 next year. F1 in Schools has also given them some incredible work opportunities that they’re taking advantage of. Kyle is working as a mechanic and data engineer with Porsche Carrera Cup and GT teams at Supercars, while David is drafting engineering design concepts and drawings for a local automotive firm. Hugh and Alec hope to complete more work experience in marketing, social media, sponsorship and business. Team Hyperdrive has got the world at their feet, and there’s no doubt they’ll be making waves in the years to come.